This combo of Peppermint & Tangerine lip balms will have your kids lip-smacking all day long! The smell of mint is heavenly! Both these products contain only organic ingredients and are completely safe for kids. Your kids will be thanking you for this divine duo. 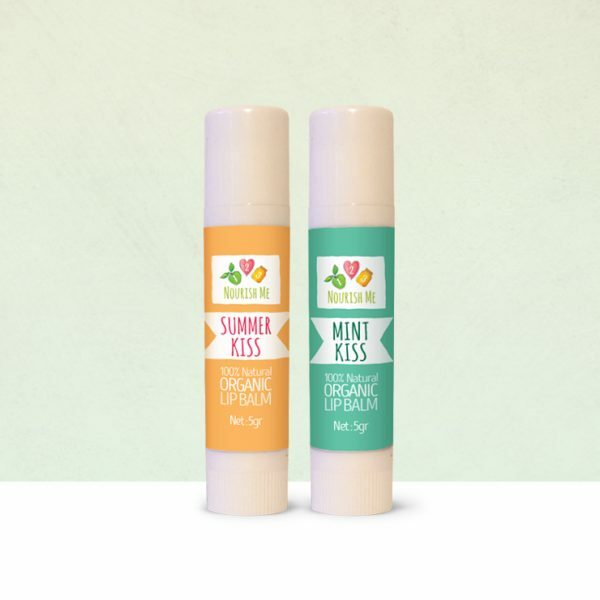 Our Summer Kiss lip balm is made from the finest-quality, fair-trade, organic ingredients, including organic coconut oil, tangerine oil and beautiful beeswax. The hydrating blend is individually poured into each tube, conveniently sized to fit in your pocket! Organic coconut oil, organic beeswax, organic tangerine peel oil, organic cinnamon bark, wild crafted murunga (kakadu plum), love & kisses. Made with 100 % organic ingredients including organic peppermint oil, organic coconut oil and kakadu plum. Organic coconut oil, organic beeswax, organic mentha avensis leaf oil, organic mentha piperita leaf, wild crafted murunga (kakadu plum), love & kisses. My 6 and 8 year old alive having their own lip gloss, and I feel happy knowing there’s no nasties going onto their skin. A product that will suit the whole family. Now that summer is upon us, have been looking for lip balms that moisturise and protect, and with no ill effects. Here it is. Will be buying again, and using myself too. Awesome awesome awesome product!! Super hydrating & smooth to apply. Totally recommend these awesome lipbalm in both flavours! 1st time purchasing and loving them, so is our 4yo son. Love the smells of these both!! My daughter used to love using Lip Smackers until I banned them! Great knowing she isn’t running chemical junk on to her lips! Love that they are free of nut oils too as she has a nut allergy and can pop them in her school bag without breaking the no nuts rule!! Love both the Lip Balms! They go on smoothly and smell divine. No more dry lips for me!! My kids and I LOVE these lip balms. My kids have sensitive skin and these don’t affect them at all. Happy kids and happy Mumma! Thank you so much for another great product. Best lip balm I have ever used. Glides on nicely, leaves your lips feeling nice afterwards, not just when its on, and doesn’t give you that horrible feeling in the back of your throat like others do from breathing them in. Peppermint is my favourite – I absolutely recommend!! Our son has commandeered these and decided they are his. Guess I’m going to have to buy more. No more chemical ladened products for us. That’s for yet another awesome product Alicia! No more chemical ladened products for us. That’s for yet another awesome productAlicia! Been looking for something like this for years! I seem to have dry lips all year round, but after a few days using both these balms, my lips have finally started feeling smooth & soft again! Thank you so much Alisa! Hope you continue to create such wonderful products! !